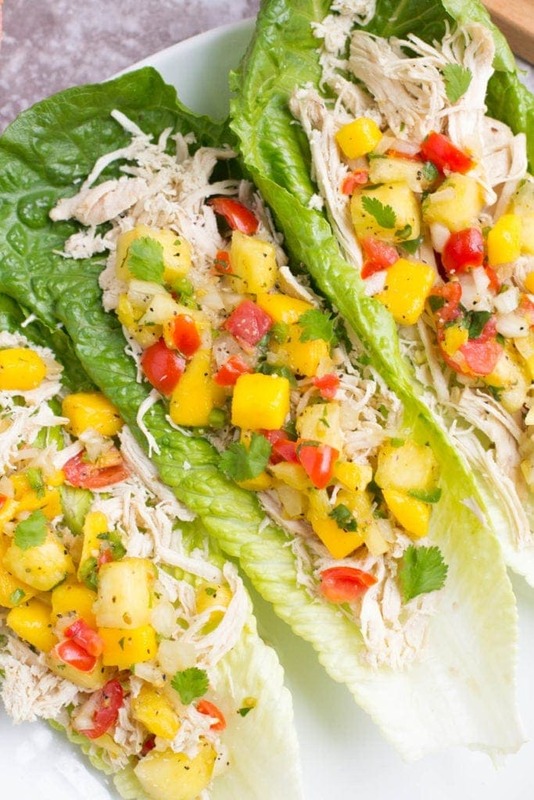 Pineapple Mango Salsa Chicken Lettuce Wraps are the perfect lighter meal. These lettuce wraps are completely gluten free, paleo, whole30 and so delicious! Made in under 20 minutes, these wraps have just a few simple ingredients and are packed with flavor while being low carb. 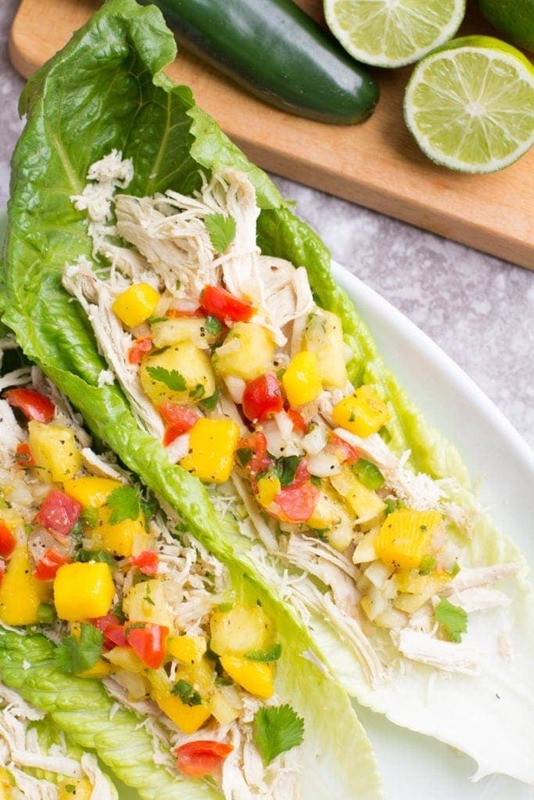 These Pineapple Mango Salsa Chicken Lettuce Wraps are without a doubt my new fav meal for Spring/Summer (and let’s be real, probably every season moving forward because they’re just so simple. These lettuce wraps are totally not blah and flavorless like some other lettuce wraps might be. They’re seriously BURSTING with flavor thanks to the Pineapple Mango Salsa that I loaded them up with and the perfect amount of spices/ lime juice. 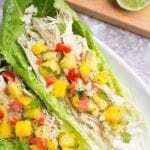 I shared a fresh salsa chicken lettuce wrap recipe about 4 years ago on the blog, which is an eternity in blog years. It was a recipe that Tyler and I had made one night for dinner, and it was super yummy so I decided I would take some photos using my iPhone + the crappy kitchen lighting so that I could share it with the world. Last year I realized that the recipe was still way back in the archives of the website and deleted it because I was fearful that someone might see the photos. They were extremely cringeworthy. In fact.. I dug up the old pin for proof. You can see it here for a laugh. When I first started this site, I (kind-of) knew how to cook… but I certainly did not have any photography skills and my food styling was sub-par. 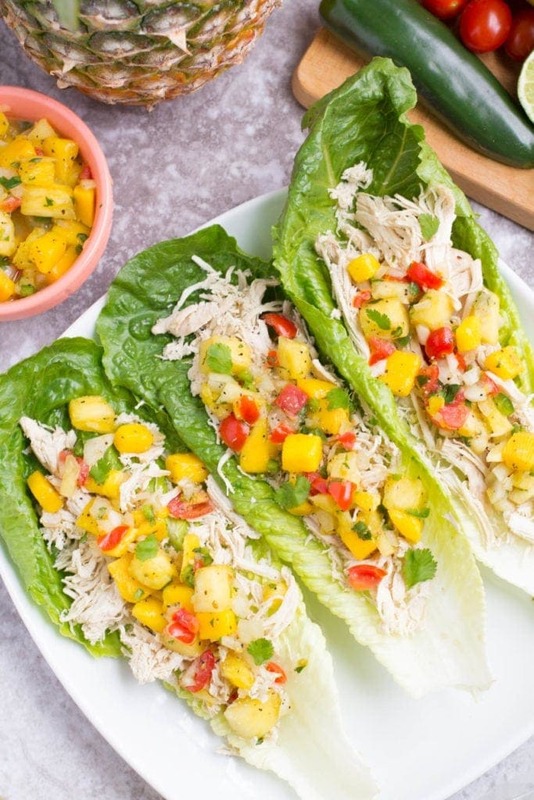 Annnnnyways, back to these Pineapple Mango Salsa Chicken Lettuce Wraps. 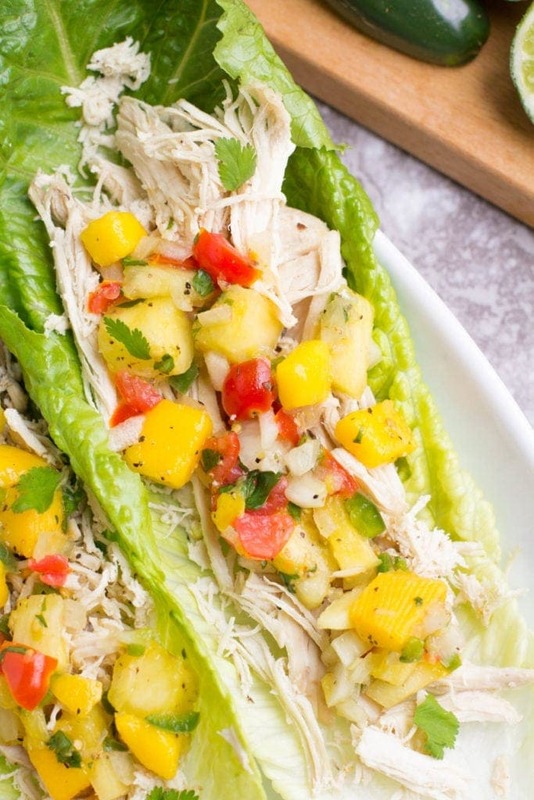 They’re basically like a little mini tropical vacation in the form of dinner. The salsa is outrageously delicious (and a total copycat of Whole Foods, just way cheaper! ), the meal is ridiculously simple (Especially if you have an instant pot to cook the chicken! )+ its straight up delicious. I think you’re going to love them! Make sure to cut in small pieces – You need small pieces to be able to scoop this up with chips! Try to dice your fruits/veggies in small tiny squares. Allow the salsa to sit before serving– This salsa is fine to eat as soon as you make it, but it’s even better if you let it sit for about an hour in the fridge + allow the flavors to meld together! Wash your hands thoroughly after making it-Especially after cutting the jalapeño! It seems like a silly thing to note, but you have to be careful when cooking with them! 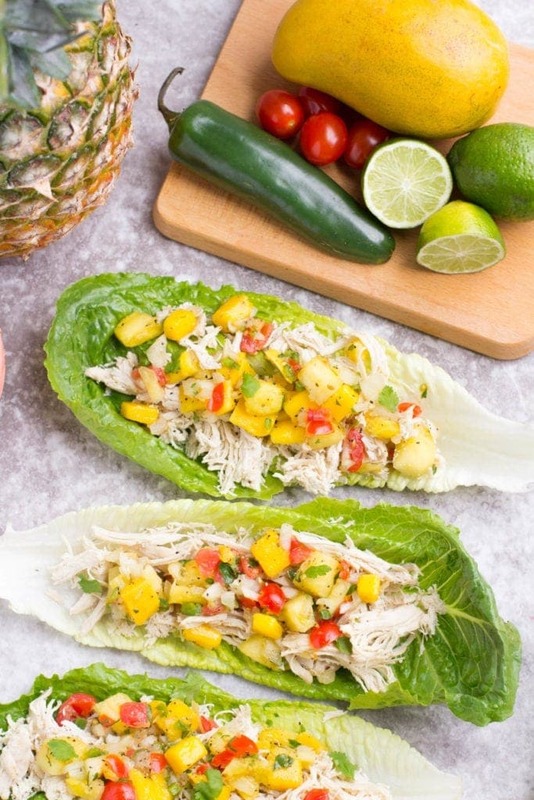 If you’re looking for an easy weeknight dinner recipe, these Pineapple Mango Salsa Chicken Lettuce Wraps are definitely going to be your new jam! I hope you give them a try + love them as much as we do! If you’re looking for other salsa recipes to try on top of these, check out this post with 20 Easy Whole 30 Salsa Recipes! 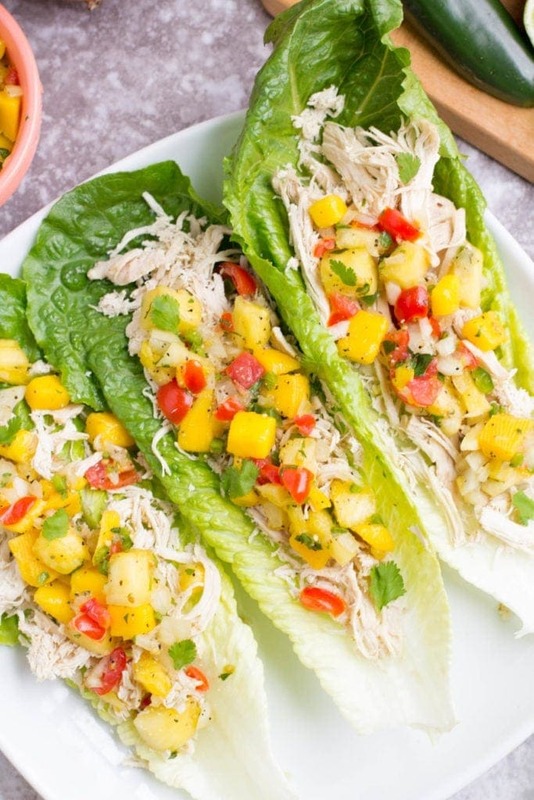 This Pineapple Mango Salsa Chicken Lettuce Wraps Recipe is the perfect lighter lunch or dinner. These lettuce wraps are completely gluten free, paleo, whole 30 and so delicious! Made in under 20 minutes, these wraps have just a few simple ingredients and are packed with flavor while being low carb. Follow this recipe for 10 minute shredded chicken in the instant pot. If you don't have an instant pot, bring a pot of water to a boil and boil chicken on the stove for 10 minutes. Otherwise, use rotisserie chicken. While chicken is cooking, assemble Pineapple Mango Salsa. Assemble lettuce wraps layering chicken + salsa. Top with avocado or additional lime juice for flavor. I’ve been in a self-proclaimed ‘chicken rut’ so THANK YOU for getting me out of it! Been searching your site for more ideas!! Awesome!! There’s nothing worse than getting stuck in the same few recipes – I’m glad you liked this!